It has been a hot (hot!) summer in BC. Here in Vancouver, we’re the ones who usually get the rain, which makes our sunny days so green and lush (not to mention appreciated). This year everything is brown and dry and we actually had a few days when the iphone was telling us we had ‘smoke’ as our weather due to all of the forest fires raging in our province. A smoky, hot city is not a fun place to be (although, I imagine considerably more fun than the many places where the fires were actually raging), so I tried to focus on some of the good that would eventually come out of it. Did you know that morel mushrooms thrive in the aftermath of a forest fire? They happen to be my favourite mushroom of all time, so this was definitely a silver lining. (To be clear, I would far prefer a forest fire-free summer over a handful of tasty mushrooms, but ashes and mushrooms are better than just ashes, right?) Another good thing to come of this is less related to fire and more related to the actual Southern Italy-like heat we were having, which equals a way above average tomato season for us. Tomato season is such a short burst of awesome, I try to eat and preserve as many tomatoes as I can during this time of year. It is such a treat when they taste this good, like tomatoes should taste, I rarely get past slicing them up with a bit of salt and pepper. This salad is a step beyond that but not by very much. It depends heavily on the flavour of your tomatoes, so make sure they are in season and nice and ripe (don’t refrigerate them, this will effect their flavour, just eat them when they’re ready). 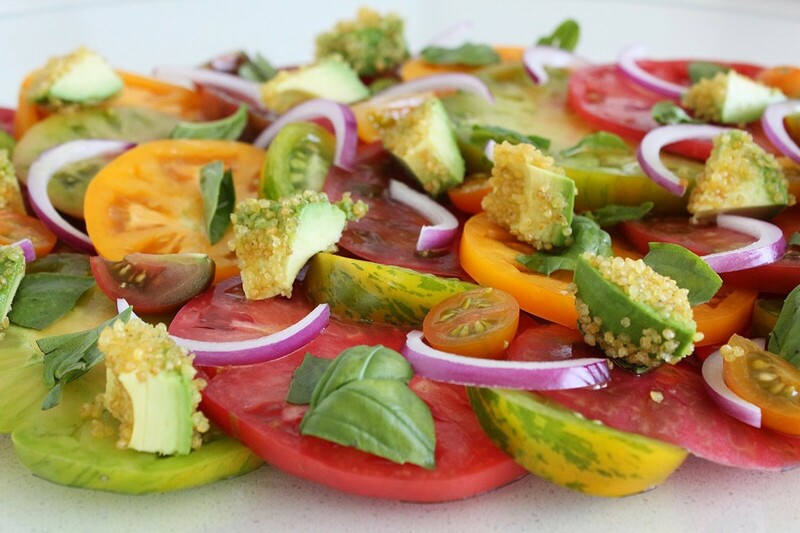 I have used heirloom tomatoes for this recipe, which are basically non-hybrid tomatoes. In the 1940’s the unique colours and shapes were bred out of tomatoes, to give them a uniform shape and red colour (not to be confused with genetically modified/engineered, this was just hybridization which is safe but boring). Heirloom tomato seeds have been ‘saved’ and passed down through generations, making a comeback, at least in North America (thank goodness), about 15 years ago. 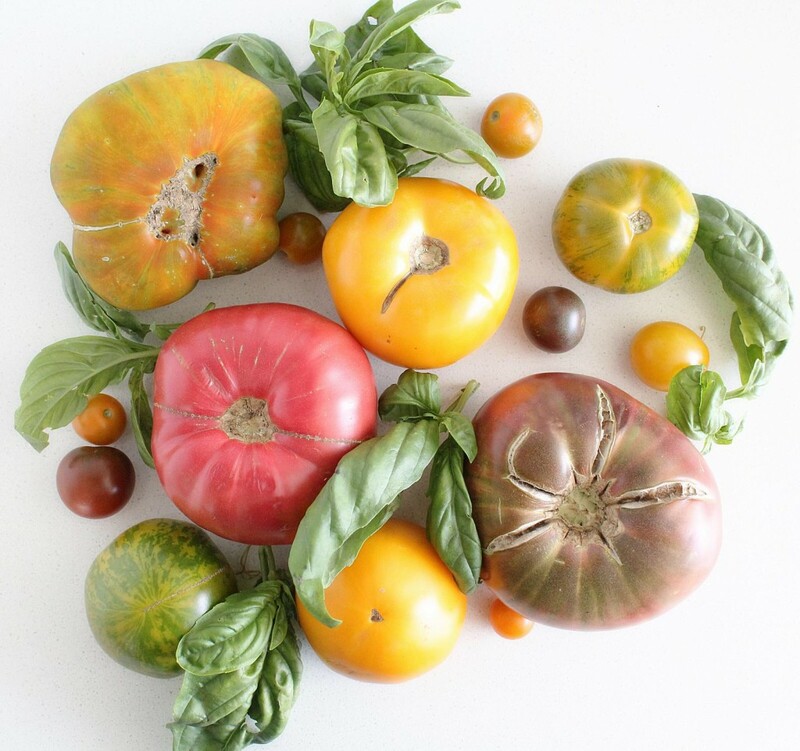 I remember sneaking a couple of heirloom cherry tomatoes home in the pocket of my chef pants for my Mom to try (they were only sold to restaurants at this point) because I could not believe how good they tasted and I couldn’t do them justice with mere words. Now they are more readily available, and you’ll recognize them by the fact that they are all different shapes, colours and sizes. It’s like they are all rebelling against their monotonous red distant relatives, and the green zebra stripes and wavy, asymmetrical flesh is their equivalent of tattoos and mohawks. They also have celebrity children-esque names like Hillbilly Potato Leaf and Big Rainbow. As if all of this wasn’t alluring enough, when they are ripe and in season, nothing tastes better, not anything. The variety of colours give you a rich array of phytonutrients and each tomato has a unique flavour, so I recommend buying (or planting!) a variety of different ones. 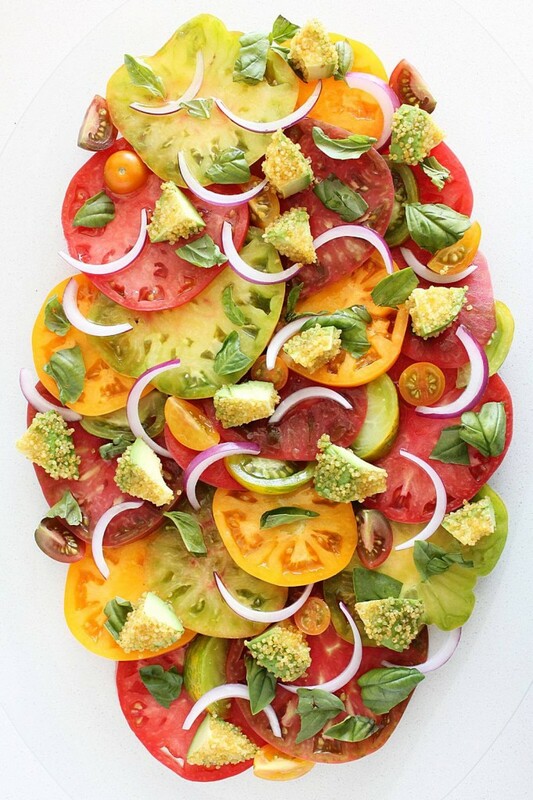 They are expensive, especially when organic (keep in mind heirloom doesn’t mean organic, be sure to look for organic heirlooms), so keep in mind, although it will be less colourful, this salad will still taste amazing with any in-season Farmer’s market tomatoes, heirloom or not. 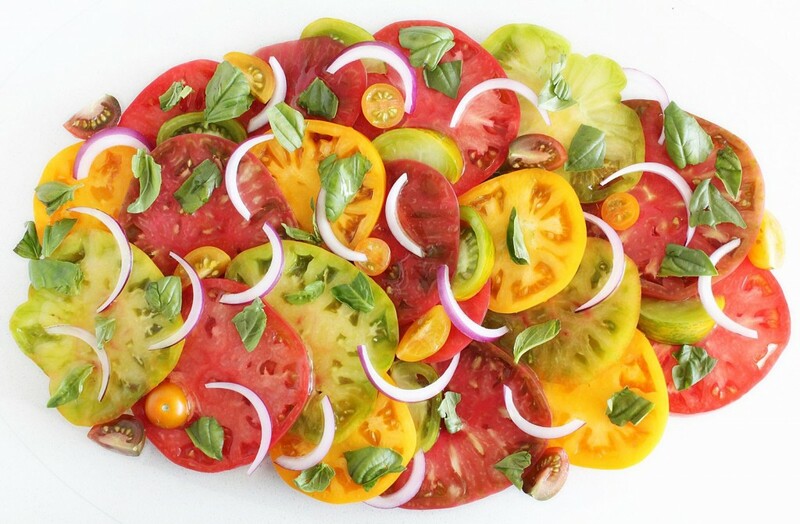 I tried to keep this recipe simple as a reflection of how little the tomatoes need in order to shine (basil, red onion, olive oil –you don’t need much more than this). But I also thought, if you were like me, you have already had this salad 4 times this week alone, and a fun curveball option might give you something to consider. These avocado and millet ‘croutons’ are my swing on crusty garlic bread croutons. 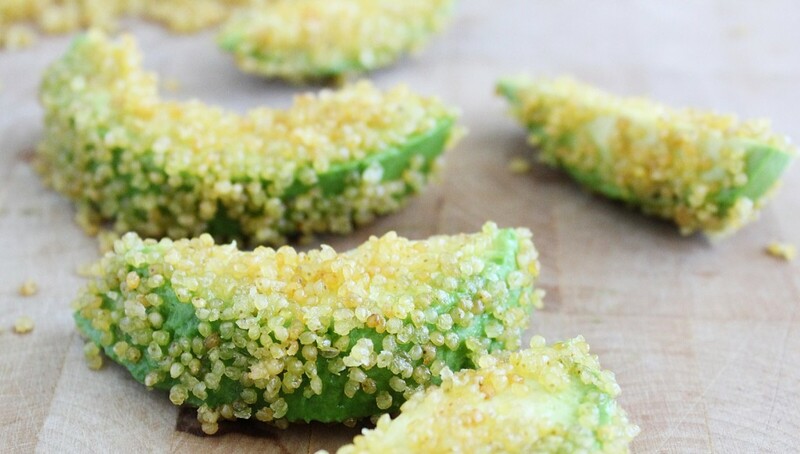 They add the crunch (crispy, roast millet), the garlic (roast into the millet) and the fat (fresh, raw avocado). You could also keep it simple and raw like I did here and just rub the avos with raw garlic pre-crusting. It is more fiddly than in-season tomato salad needs to be, but well worth it for the delicious and satisfying results (and the extra protein and healthy fats). On a platter, layer the tomato slices down first, followed by the onions and basil. (A layer of leafy greens and some extra cooked millet or quinoa under this would be a welcome addition). Drizzle the lemon juice over top, followed by the olive oil. Scatter the croutons over top and serve. 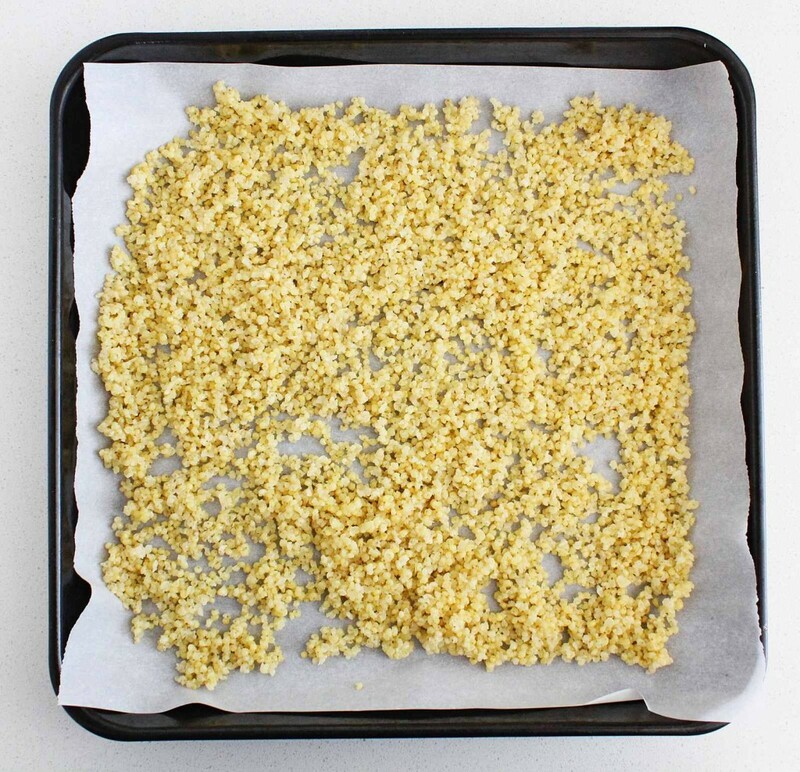 Toss your cooked millet with the melted coconut oil, garlic, turmeric and some salt & pepper. 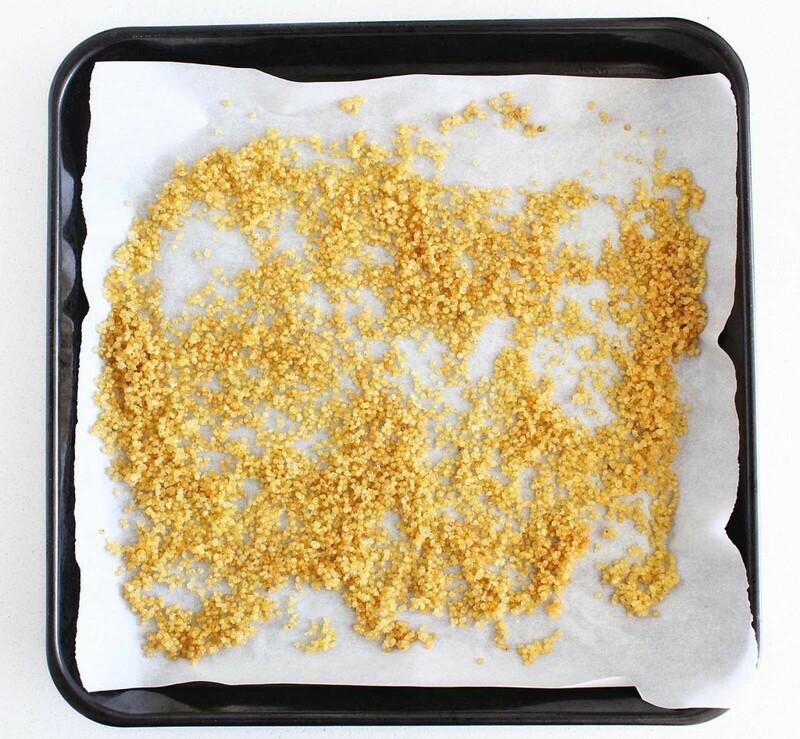 Spread it out on a parchment-lined baking sheet. 'Roast' for about 20 minutes or until it tastes crunchy and is just about to turn golden brown. 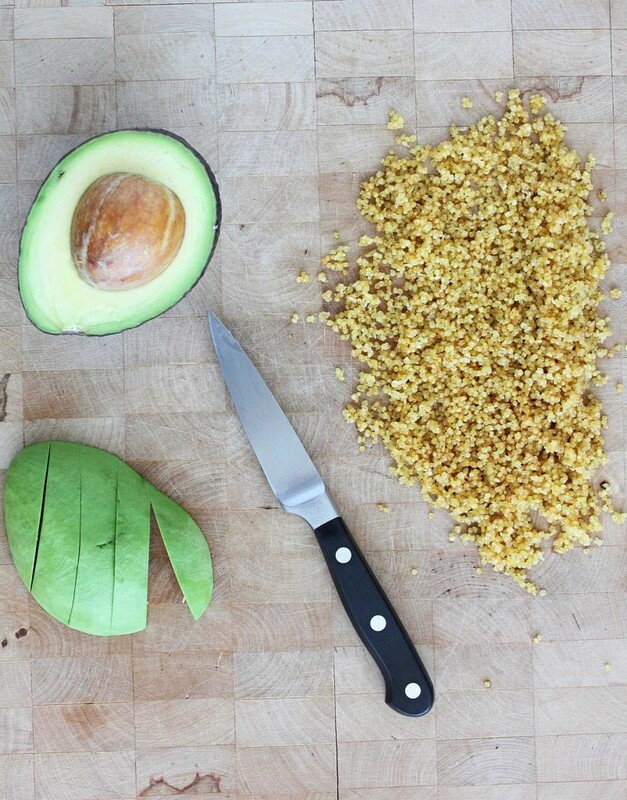 Slice your avocado into slices and press the slices gently into the millet. Chop these slices into 3-4 square pieces each (bite-size). Eat them just like this (you're going to want to) or top your salad off with them before serving.